Next week opens a national juried exhibition held at the Randy Higbee Gallery in southern California and I am pleased to share with you that one of my little floral paintings was accepted into the show! 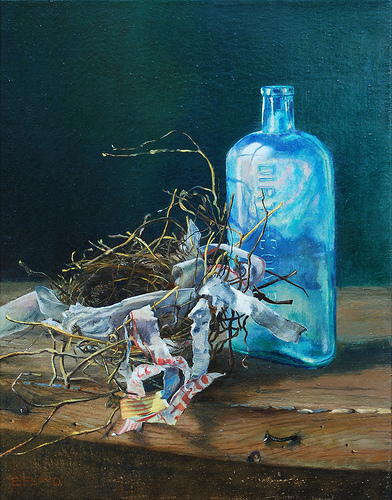 Still Life with Freesias, Bottle, and Bowl was one of the 400 paintings selected out of 1200+ submitted pieces. 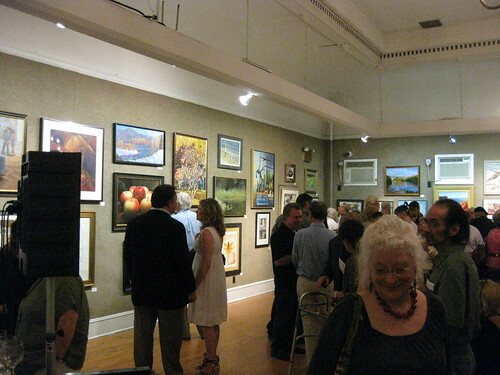 The artist reception will be held on April 16th, and the show will run until May 6th. If you happen to be in the area please stop by and see the show, I am certain it will be a fantastic grouping of artistic talent. 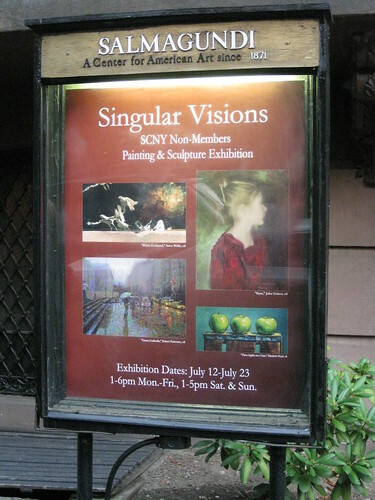 Last year after being part of the Non-member Salmagundi Club Juried Exhibition, I was invited to become a member of the Salmagundi Club. I was honored by the invitation and applied, after waiting for several months I received notice that I had been voted in! This painting is my first submission to be included into one of the many member shows held at the club, the 2nd Annual Sylvia Glesmann Floral Exhibition. The show will be open until March 30th, gallery is open to the public daily from 1pm to 5pm (Sun-Sat) and is located at Forty-Seven Fifth Avenue, New York, NY 10003. And this painting is part of the Spring Auctions held to support the Salmagundi Club. For more information about the auction, please click here. This is because I am expecting a little girl in late summer! My plan is to keep painting and creating everyday, however some aspects of my schedule may change and adapt as the pregnancy moves forward. 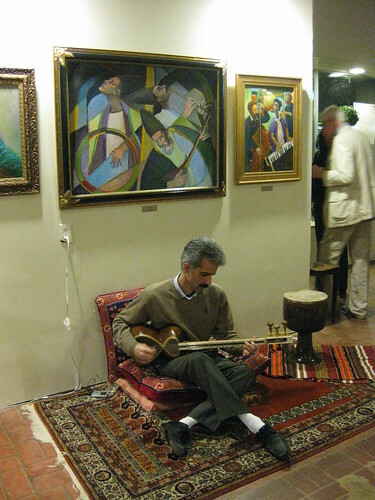 Yesterday evening I attended the opening of a good friend's, Habib Hastaie, solo show in Potomac, MD. 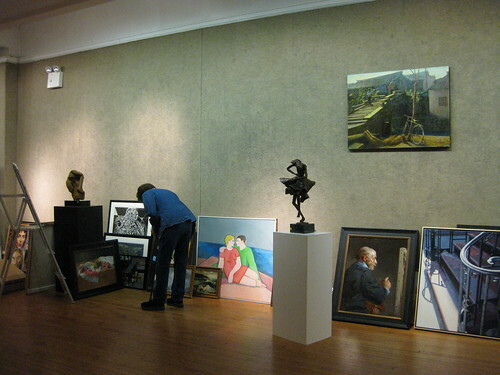 His work is being shown at the Art Gallery of Potomac. 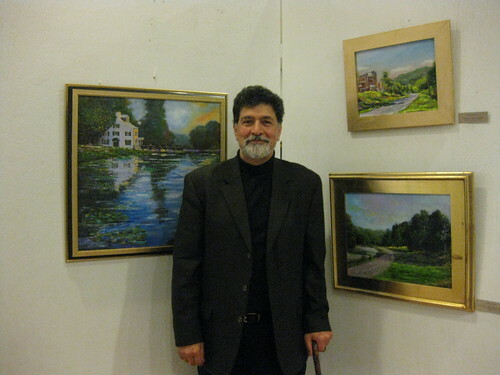 The show runs through December 19th, so if you find yourself in Potomac, MD please stop in to view his work. 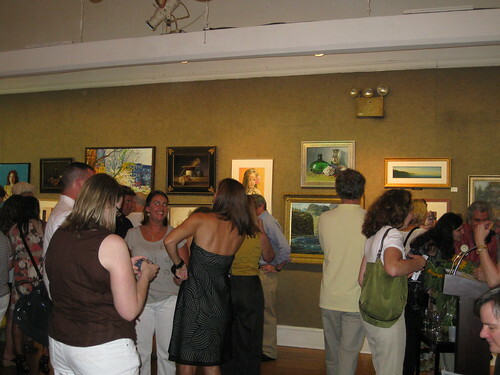 The gallery is located at 10107 River Road Potomac Maryland 20854. PS. Here are more photos from the opening. 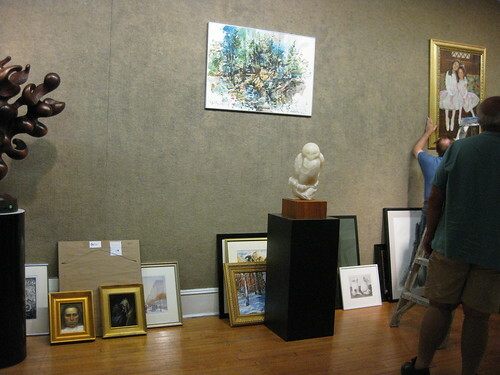 This Saturday I took the bus up to NYC to deliver a painting for the Audubon Artists Annual Juried Show, hosted at the Salmagundi Club on Fifth Ave. 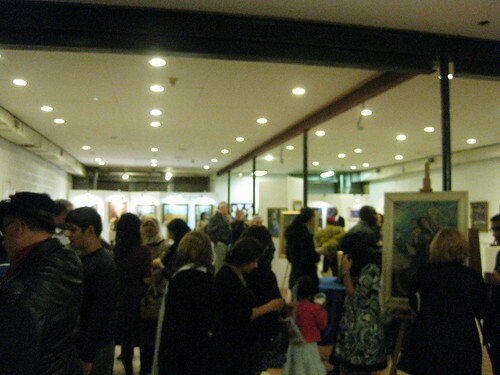 This was my first time participating in the show and from the paintings I saw coming in, it is going to be a great show. A lot of beautiful work was accepted into the show and I am honored to be part of the show. 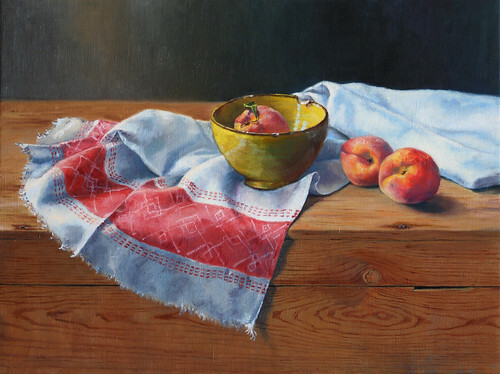 My painting, Fresh Peaches, will be part of this exhibit, on display from September 13th to October 1st in both the club's galleries. If you are in the area, please stop in to show your support for the talented artists chosen for this year's event. 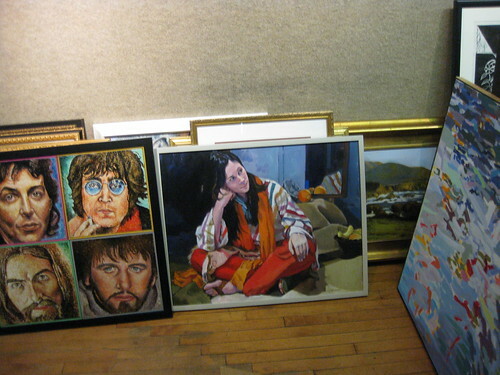 The Salmagundi Club is located at 47 Fifth Avenue in Manhattan, and is open from 1:00 to 6:00pm weekdays, and from 1:00 to 5:00pm weekends. The reception will be held on Sunday, September 26th from 2:30 to 5:00pm. PS. Fall term is about to start again at the Alexandria Art League and I have a ton of loose ends to tie up before then, so I will not post for a bit and will not have an update for the copyist work I am doing at the NGA this week. Thanks and see you soon. 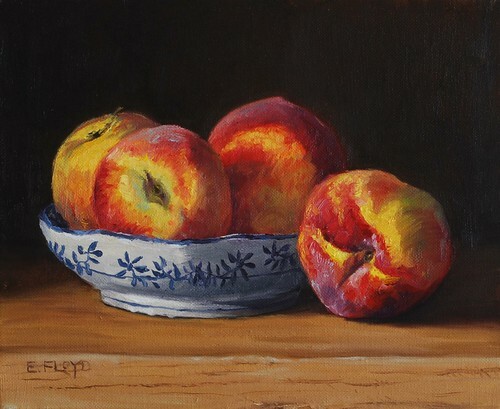 This Friday S. and I took the bus up to NYC to attend the Salmagundi Club Non-member show where my painting of the Three Apples on a Crate was accepted. It was an amazing afternoon and evening. 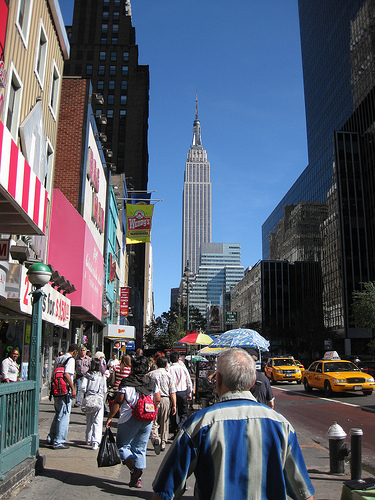 We walked around NY visiting a gallery, having a wonderful meal, and then seeing all the great art in the show. The variety of subject matter and style was inspiring, encouraging me to experiment and strive more. 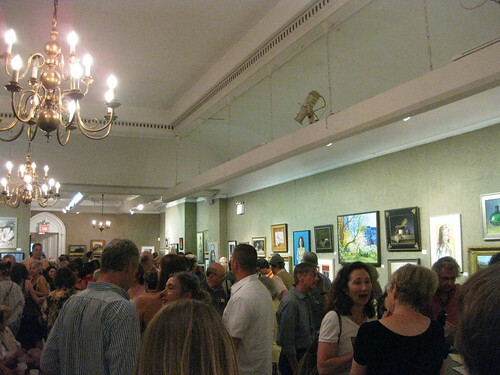 As the reception was winding down a kind attendee let me know that my painting was included on the show poster! S. and I had entered from the other side and had not seen the poster. Here is a photo of me and my painting, the portrait above is the of a man named Berry, who founded one of the farmer's markets in NYC. 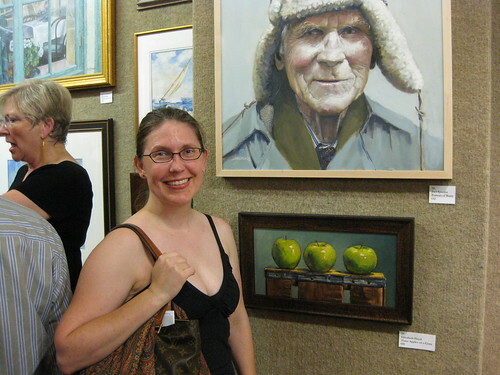 The artist of this portrait thought it was fitting that my painting of green apples was placed below his portrait as a green apple is the symbol of this farmer's market. Here are a few more photos of the reception. On Saturday we spent the day at the Met, visiting the Picasso exhibit and touring other galleries, especially the European paintings. I took a lot of photos of various details from paintings that I found interesting.